As well as having the ability to bookmark an article or book from the web or the library catalogue, Resource Lists using Talis Aspire also has the ability to import your reading list from an existing bibliography or reference document. You can export any bibliographic/citation list from your reference managing software such as EndNote, RefWorks, CiteULike, Zotoro etc. and upload this directly into My Bookmarks for use in any of your Resource Lists. Additionally, Queen Margaret University have created two excellent video tutorials on how to export from EndNote desktop and EndNote web, how to save and then how to import your bibliographies into Talis Aspire. This entry was posted in Library, Online library resources, Research & Learning Services and tagged Library Learning Services, ResourceLists, ResourceLists@Edinburgh on April 29, 2014 by Stephanie Farley - Library Learning Services. Q. What is a Resource List and what does it look like? Resource Lists using Talis Aspire allows lecturers to connect with their students by creating dynamic reading lists that contain notes for students and item information for library staff. Here is a a short 1.21minute film created by Talis Aspire to explain some of the benefits and features. 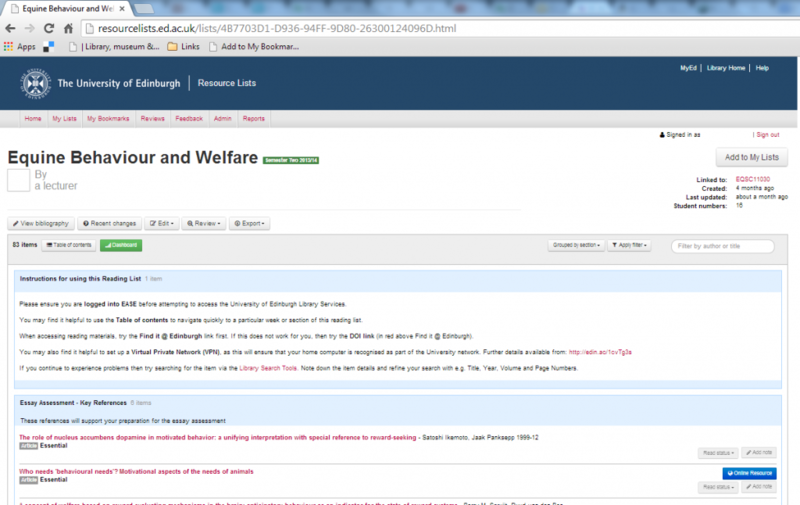 More information on getting started and how to make the most of Resource Lists can be found on the Resource Lists using Talis Aspire webpage and the ResourceLists@Edinburgh Blog. This entry was posted in Library, Online library resources, Research & Learning Services and tagged Library Learning Services, ResourceLists, ResourceLists@Edinburgh on April 23, 2014 by Stephanie Farley - Library Learning Services. Resource Lists are created by ‘bookmarking’ resources. A bookmark can be created from any item that has a URL (web address). This can include links to resource list items such as books, book chapters, e-books, journal articles and websites. In the video below, Talis Aspire explain their thinking and processes around the development of bookmarks as a tool. This entry was posted in Library, Online library resources, Research & Learning Services and tagged Library Learning Services, ResourceLists, ResourceLists@Edinburgh on April 17, 2014 by Stephanie Farley - Library Learning Services. Resource Lists @ Edinburgh are managed by Library Learning Services at the University of Edinburgh Library. For more information on our service please visit our Resource Lists using Talis Aspire website. We are more than happy to to visit your School or department to discuss Resource Lists, and also provide demonstrations and hands-on experience workshops. If you have any enquires or would like to discuss Resource Lists with us or arrange a workshop or demonstration, please don’t hesitate to get in touch. This entry was posted in Online library resources, Research & Learning Services and tagged Library Learning Services, ResourceLists, ResourceLists@Edinburgh on April 16, 2014 by Stephanie Farley - Library Learning Services. At your request we can turn your Reading List into a Resource List, creating the initial list for you at resourcelists.ed.ac.uk then placing it back in your hands for publishing at a time of your own choosing. Part of this service also includes providing a summary of the items on your list, books, journals and articles, with information on how many are held and at what locations within the University of Edinburgh Libraries. We will provide information on how to edit and maintain your Resource List once it has been handed over to you, and are available to answer questions and provide Resource List guidance during every step of the academic year. This entry was posted in Library, Online library resources, Research & Learning Services and tagged Library Learning Services, ResourceLists, ResourceLists@Edinburgh on April 14, 2014 by Stephanie Farley - Library Learning Services. How can ResourceLists@Edinburgh help compliance with the Accessible and Inclusive Learning policy? Reading lists at this stage may focus on the core texts only (where they are used). Additional reading may be provided nearer to the start date of the course. Resource Lists can be created quickly, published at any point, can be edited, added to, and updated throughout the semester. This means no waiting around for handbooks to be published or for a reading list to be complete. Resource Lists can be published with just the core (essential) resources and then updated at a later time. Reading lists shall indicate priority and/or relevance. These are easily set by selecting from a drop-down list. It’s not necessary for the entire Resource List to be prioritised, but the list should indicate which resources are considered to be key (Essential or Recommended) to understand themes within the course and those which are supplementary (Further Reading). The policy allows that in some subjects it may be necessary that students prioritise reading lists for themselves (in such cases this should be reflected and clearly stated in the learning outcomes of the course and should be assessed, otherwise it is not justified), if this is the case, notations can be applied to the Resource List in order to communicate this to the students. Remember, we can help you. Library staff are available to create new Resource Lists for Course Organisers, and once created we will hand over the list or lists for ongoing maintenance. This entry was posted in Library, Online library resources, Research & Learning Services and tagged Accessible and Inclusive Learning, Library Learning Services, ResourceLists, ResourceLists@Edinburgh on April 11, 2014 by Stephanie Farley - Library Learning Services. Undergraduates from Nottingham Trent University talk about their first impressions of using Resource Lists with Talis Aspire. This entry was posted in Library, Online library resources, Research & Learning Services and tagged Library Learning Services, ResourceLists, ResourceLists@Edinburgh, User Feedback on April 8, 2014 by Stephanie Farley - Library Learning Services. Dr Gary Motteram, Senior Lecturer at the School of Education, University of Manchester, talks about his initial reaction to Resource Lists using Talis Aspire, and how it meets his needs when working on his reading lists. This entry was posted in Uncategorized and tagged Library Learning Services, ResourceLists, ResourceLists@Edinburgh, User Feedback on April 4, 2014 by Stephanie Farley - Library Learning Services. Resource Lists has a newly updated webpage, including a revised User Guide and a selection of shorter focused guides on specific tasks within Resource Lists. This entry was posted in Uncategorized and tagged Library Learning Services, ResourceLists, ResourceLists@Edinburgh on April 2, 2014 by Stephanie Farley - Library Learning Services. Library Learning Services are promoting ResourceLists@Edinburgh using Talis Aspire, as a dynamic way to provide reading lists and resources. Resource Lists are created using bookmarks and can link to any resource that has a URL (web address). A variety of resources can be added to a list, including, books, e-books, book chapters, journal articles and web pages. A selection of guidance lists have been created on the use of sections, notes, fields, and general good practice to demonstrate the variety of resources and formats available. These are available for viewing on Resource Lists – Guides on Resource Lists (note: if you are not already, you will be prompted to log in to EASE to access the University of Edinburgh Library subscription content). Our blog also contains a detailed user guide and a series of short guides that focus in on specific tasks and functions available within Resource Lists. Additionally our blog and twitter account will be regularly updated with important notices and updates, tips, tricks and information on using and making the most of ResourceLists@Edinburgh. This entry was posted in Uncategorized and tagged Library Learning Services, ResourceLists, ResourceLists@Edinburgh on April 1, 2014 by Stephanie Farley - Library Learning Services.